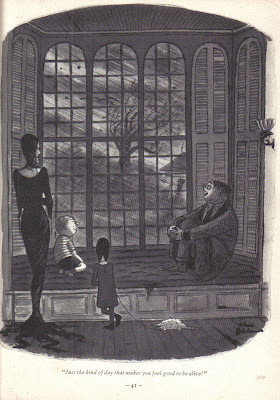 I grew up with a strange book in my father's den: Homebodies by Charles Addams. It was macabre, gothic, and grotesque before Gorey, before Buffy. The ninety pages of this 1954 Simon & Schuster book are filled with the black humor of The New Yorker cartoonist, Charles Addams. It's said that as a child Addams would on ocassion wander into a graveyard, but he grew up in suburban New Jersey. I got to meet Mr. Addams in the yellow-walled New Yorker offices when I did cartoons for them in the late 1970's. He would sometimes give me a critique of my sketches before I went in to see Lee Lorenz, the cartoon editor. This only lasted a few weeks as I had mistakenly gone to the offices on Wednesdays, when the veteran cartoonists were there, and I was soon shuffled off to Tuesdays, when the "young Turks", such as Roz Chast and Robert Mankoff, were there. Speaking of Wednesday, his Addams family was later spun off into a not so grotesque TV comedy with Wednesday as the little girl and Pugsly as the pudgy little boy. Click on the picture to see the dreary detail, such as the pet alligator. The caption reads: "Just the kind of day that makes you feel good to be alive!" He always signed his work Chas Addams in dark script. Happy Birthday, Chas. His work predates Gorey, eh? I didn't even know about this book. I grew up watching the Addams Family in black and white and longing to be Morticia. Okay, I've looked you up. May I say in my defense that I don't have any children and so am not up-to-date on your body of work. I shall have to do something about that. The books at my grandmother's house were mostly "book of the month club" bindings mixed with an assortment of children's books from the 1940s. She had this book in her bookcase though. I would grab the book to read every time we visited. It was so weirdly compelling. That was a long time ago. Looking back, I wonder how she came to have that book on her shelf? Not her usual reading fare. Thanks for reminding me of those happy hours. 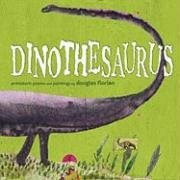 I wnoould not have recalled the title of the book without your post. 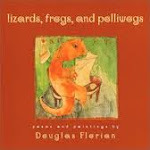 Oh, Poeticat...Douglas is one of the greats! Though I also did not know you drew cartoons for the New Yorker, very cool! I also did not know the origin of the Addams Family...only knew of the show...which was so quirky and funny! I had no idea of the origin of The Addams Family t.v. show. I know very little about art, but I love Edward Gorey's stuff. I remember my parents watching PBS Mystery! when I was in high school and hearing the strange music/shrieking and seeing his title art. Love that. This Addams illustration is so cool. I'm going to have to add this to my long list of artists I need to educate myself about! Douglas - I really feel that I've missed out - coming to your work so late, but I hope to rectify that. Valentine's Day is coming up -- I think one of your books may make a very good gift from my husband. Douglas - just slipped my Complete New Yorker discs in to my computer and looked at your long list of contributions - that is impressive. Double-page spread cartoons! I love the constellations. And the cover of the guy on the bridge. 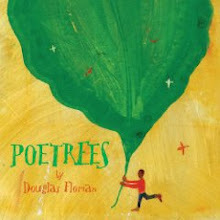 Your talents go many directions!So glad your particular twist on things has been applied to picture books and poetry for kids, too. Thanks guys. I think I'll post one of my old New Yorker cartoons next week.